Bike Advertising Techniques with tear drop banner flags promote or advertise your product or message in a cost effective, eco-smart, friendly and visible way above all other forms of bike or bicycle advertising vehicles. 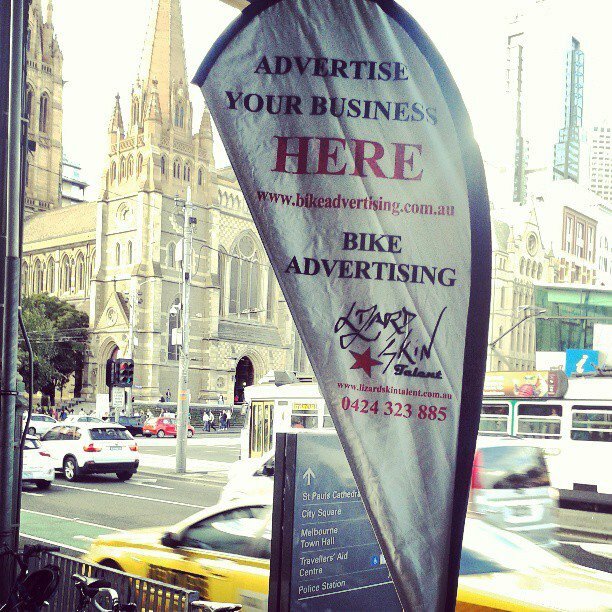 Bike Advertising Techniques with Tear Drop Flags are perfect at Melbourne’s Elite Sporting events, Festivals, Parades, Trade shows, St Kilda’s beach side boardwalks and busy train stations. Ideal anytime anywhere and everywhere there is a crowd..Bike Advertising Techniques is a green clean smart way to be seen with the addition of a Lizardskin Model distributing flyers to create a call to action.